Picked Jeen up from her place at 8pm on Saturday night for our weekly get together. This time, I decided to take her to William’s for glorified mamak food in huge portions. Since rif tagged along, we got to order more food to try. We decided on the Mango Ice Blended for drinks (RM6-big, RM4-small) and the Premium Mixed Grill (RM30) to share. The mango ice blended came with lychee and watermelon cubes. 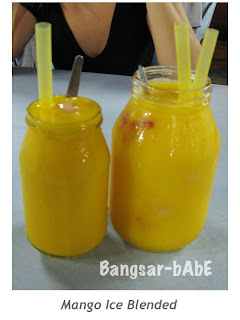 I prefer the mango ice blended from Murni as they use mango puree in their ice blended. This one was made using mango cordial which I didn’t quite like. Tasted artificial. 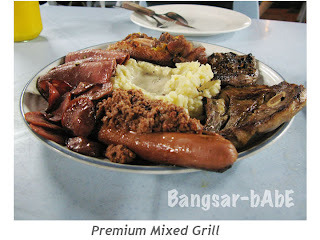 The mixed grill came with chicken, beef, lamb, sausage, ham, salami and mash potatoes. The chicken was very well marinated and deep-fried till golden brown while the beef; nicely grilled to retain its juiciness and flavour. The lamb chop was tasty despite being a little on the fat side. The sausage, ham and salami served with bolognese sauce were standard. We couldn’t get enough of the mash potatoes, topped with cheesy-like cream sauce. Good stuff. 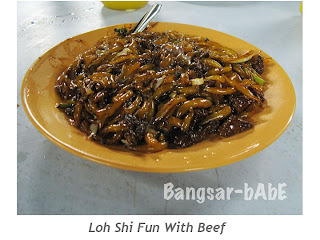 Halfway through our meal, we ordered the Loh Shi Fun With Beef (RM7). The loh shi fun was as good as I remembered. Maybe better since I had it with chicken slices the last time. The beef slices were really tender and well marinated. We ate the loh shi fun with their killer sambal belacan. S-H-I-O-K.